Bob Budah (left) and Josie Budah (second from left), Owners/Directors, Park Shore Country Day Camp, present a check for $5,000 to Hans Zobel (second from right), Chairman and Joani Madarash (right), Immediate Past Executive Director, SBPLI, as part of its sponsorship of School-Business Partnerships of Long Island, Inc. at the 5th Annual SBPLI Golf Outing, held on October 6 at Stonebridge Country Club in Smithtown. 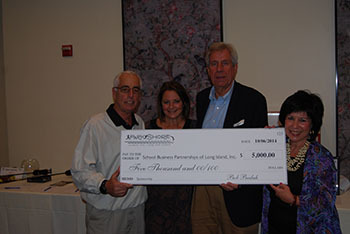 In support of School-Business Partnerships of Long Island, Inc. (SBPLI), Bob and Josie Budah of Park Shore Country Day Camp presented SBPLI with a check in the amount of $5,000 for its sponsorship of the 5th Annual SBPLI Golf Outing, which took place on October 6 at Stonebridge Country Club in Smithtown. Park Shore Country Day Camp has been owned and operated by the Budah family since 1959. The camp is dedicated to providing quality skill development programs, modern facilities and individualized attention to campers. The camp is working in conjunction with SBPLI this summer to offer The Science Academy at Park Shore, a summer robotics camp for children in grades one to five. SBPLI works hard to inspire students to pursue careers in science, technology, engineering and mathematics. It proudly sponsors and manages three unique FIRST® programs on Long Island, including the FIRST® Robotics Competition, FIRST® LEGO League and Junior FIRST® LEGO League. For more information, visit www.sbpli.org.